Chitika blew my mind. I remember the day I came across it and was impressed with it because, like AdSense, it was just a matter of copying and pasting code into my blog to show the ad – but unlike AdSense it showed ads with product images IN the ad unit. This was particularly good for me because my blog at the time was a camera review blog and I was talking about products every day. I excitedly added an additional Chitika ad unit to every page on my photography blog at that time and the next day logged in to see how it had performed. It did really well and that single ad unit made about 25% of what AdSense did every day. Over the coming weeks I added more ad units and tested new positions of ads and grew that Chitika income to the point that some months in the year that followed saw it earn more than AdSense. Amazingly to me this increase in income from Chitika didn’t come at the expense of AdSense which continued to work well. Note: Chitika ads don’t work perfectly on every blog. I myself noticed that they slowly slid back in what they earned over the next few years and today I don’t use them any more – mainly because we’ve moved to selling ads directly to advertisers (more on that below). As my blogs and my own personal profile grew (particularly here at ProBlogger) I began to notice opportunities open up for me to generate an income by offering my services of creating other products to sell. These largely fell into three categories – speaking, consulting and writing a book. The speaking came first. 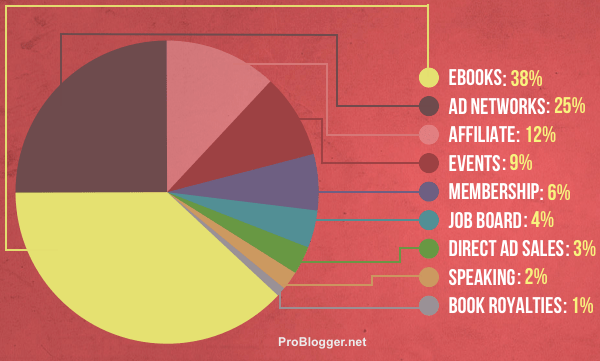 I had already done a little speaking for free in my local area, but after launching ProBlogger I began to get paid opportunities to speak to groups about blogging. These started off being local opportunities in my city but then grew to become interstate and international. Similarly, as my readership on ProBlogger grew, I began to get emails from readers wanting to hire me to help them with their blogging. I began to offer ‘blog consulting’ services where I would charge an hourly rate to advise bloggers. I didn’t stick at this for long as I didn’t find it as enjoyable as actually blogging – and I also thought I could probably help more bloggers by writing about blogging rather than working one on one with bloggers. Also around this time I was approached by Wiley US to write the first edition of the ProBlogger book (a paper one). This book is now in its third edition. While speaking, consulting, or the book never became million dollar income streams, they all did help me to diversify my income – they also all helped me to grow my audience and learn a lot! Over the years since numerous other income streams have emerged. These have come to include the Job Board here on ProBlogger, the membership site at ProBlogger.com (stay tuned for some big news about this in the coming months) and what became my biggest income stream – selling eBooks that relate to my blogs topics. Each of these streams started as a small experiment to see what I could learn and what I could grow. The job board has been a slow burner income stream in many ways. It generally only sees 1-2 jobs added to it every day at $50 a pop, but over the years this has added up to bring in more than $100,000. eBooks had a more spectacular impact on profit. Again, I started slow with a single eBook that I put together largely by myself and a little outsourcing. I didn’t know how it would go but after nervously launching it to the photography blog audience that I’d worked hard to build up, it generated over $70,000 in a week (important note: I had been blogging on that blog for years and had build a decent audience – it didn’t happen overnight)! The success of that eBook launch led me to publish more photography eBooks (15 so far) and ProBlogger eBooks. As Digital Photography School has grown, there have been a number of opportunities to start new related ventures off the back of that original site. The first of these was SnapnDeals – a deals site for photographers where we promote both our own eBooks that might be on special, but also other people’s products as an affiliate. Similarly, we’ve also launched SnapnGuides – a photography mini-eBook site (we’ve published two eBooks there so far) that are smaller and cheaper eBooks/guides on niches of photography. I have numerous ideas for other smaller ‘sister sites’ for the photography niche that I’d like to roll out in the coming years. Four years ago I had an impulsive idea to run an event for Aussie bloggers. Six weeks later we held our first ProBlogger Training Day for 100 bloggers in Melbourne. We’ve held this event every year since, each each time growing not only attendance levels, but also the professionalism of the event. We’ve also added a ‘virtual ticket’ for those unable to get to Australia for the event. While not a huge money spinner, it is another income stream in the business and helps support other aspects of what I’ve built. In the last few months I’ve circled back to one of the early income streams that I touched on above – direct sales of ads. I’ve never really stopped doing this but last month have completely removed AdSense from my blogs for the first time since I started blogging and have engaged the services of a great little team of ad sales specialists to sell ads directly to advertisers. The initial results have been very encouraging! While I know some people have a lot of negative things to say about AdSense, I’ve never really written it off completely. It’s an ad network that has generated over a million dollars over the last nine or so years, and the people at Google have been nothing but helpful to us. But for now, we’re seeing more potential in working directly with brands. Here’s a breakdown of my own income streams in April of this year. While it doesn’t reflect the switching off of AdSense (Ad Networks) or the increased attention to direct ad sales, it shows you how I’ve become less reliant upon any one stream of income for my blogs. What is Your Income Split Like? That’s my story – what about you? Of course there are many many more potential income streams for a blog, but I’d love to hear your experience. Have you got a variety of income streams? Or are you focusing pretty heavily upon a single one? I’m definitely the new kid on the block, but I know exactly what you’re talking about when you say you have to diversify. I will never put all my eggs into one basket, NEVER! GREAT ARTICLE, it really makes you think. Great post Darren! I am currently in the process of streamlining my blog and preparing it to become an income source as I position myself as a speaker, writer, consultant, etc. I’d love to hear more about how you first got started earning revenue in the early days and what you wish you knew back then when you first started. Good article. The pictures are especially great! I think that visual tips are the most productive. Thank you for being so awesome! From you graph it is apparent that you making most of your income from Ebooks. Now, as simple as thought sounds, it might take me longer to know built an email list that can later turn into sales. I’m currently struggling with traffic and only 2 subscribers who aren’t even interesting int he blogging topics I write on. Thanks for the info anyway. I am working on diversifying my blogging income. I have an ebook idea that I think is pretty good. I’ve never really done that much with AdSense over the years, although know from talking with other bloggers it has been a big part of a lot of people’s incomes. To see and hear about your own diverse income model is really useful – far too often we are stuck following one “road to riches” while ignoring lots of little laneways that might easily add income if we took the time and made the effort to explore a little.